You might be surprised to learn how many parades we have in the Phoenix area throughout the year. Community parades, horse parades, gay parades, parades that get national attention -- we have them all in Greater Phoenix. Who doesn't love a parade? If you do, you and the family have plenty of opportunities in the Phoenix area to attend one. 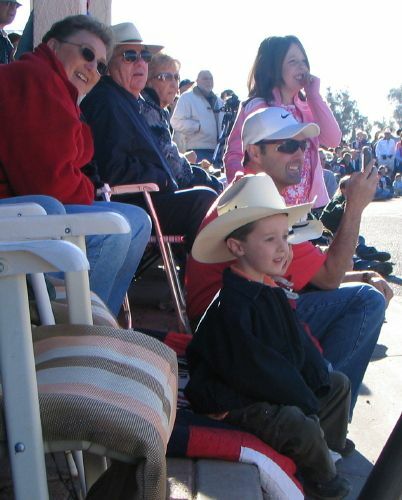 The Gold Rush Parade is a Wickenburg tradition, associated with the annual Gold Rush Days Celebration and Rodeo. Here's an entire photo gallery dedicated to the Wickenburg Gold Rush Days Parade in Wickenburg, Arizona. Continue to 2 of 67 below. Continue to 3 of 67 below. The Parada del Sol is organized by the Scottsdale Jaycees, and has the distinction of being known as the World's Largest Horse Drawn Parade. Here's an entire photo gallery dedicated to the Parada del Sol in Scottsdale, Arizona. Continue to 4 of 67 below. Continue to 5 of 67 below. Who doesn't love a parade? If you do, you and the family have plenty of opportunities in the Phoenix area to attend one. This parade takes place in the southwest part of the Greater Phoenix area. The cities of Avondale and Goodyear hosted a celebration on Feb. 25, 2012 to commemorate the Arizona’s 100th birthday. More than 80 entries participated in the Tale of Two Cities Parade, which took place on Thomas Road from Litchfield to Dysart Roads. Continue to 6 of 67 below. Who doesn't love a parade? If you do, you and the family have plenty of opportunities in the Phoenix area to attend one. You don't have to live in New Orleans to celebrate Mardi Gras! The Mardi Gras Parade in Phoenix is one of several events associated with Mardi Gras celebrations in the Phoenix, Arizona area. Continue to 7 of 67 below. Continue to 8 of 67 below. © Chandler Chamber of Commerce, used with permission. The Ostrich Festival Parade is held a week before the very popular Ostrich Festival in Chandler. The parade is sponsored by Thorobred Chevrolet. Before the parade, there is a 5K Fun Run. Continue to 9 of 67 below. The Ostrich Festival Parade is held a week before the very popular Ostrich Festival in Chandler, AZ. Before the parade, there is also a 5K Fun Run. Continue to 10 of 67 below. Continue to 11 of 67 below. © Irish Cultural Center of Phoenix, Arizona, used with permission. Who doesn't love a parade? Of you do, you and the family have plenty of opportunities in the Phoenix area to attend one. The St. Patrick's Day Parade is always held in March, of course, in conjunction with St. Patrick's Day events. Here's an entire photo gallery dedicated to the St. Patrick's Day Parade in Phoenix. Continue to 12 of 67 below. Continue to 13 of 67 below. Continue to 14 of 67 below. © City of Peoria, Arizona, used with permission. The Peoria Pioneer Day Parade is held in conjunction with the Peoria Pioneer Day Festival in Peoria, Arizona. Continue to 15 of 67 below. Continue to 16 of 67 below. © Phoenix Sister Cities, used with permission. Phoenix Sister Cities includes a parade during their annual multicultural festival, WorldFEST. Continue to 17 of 67 below. © Fran Booth, used with permission. Who doesn't love a parade? If you do, you and the family have plenty of opportunities in the Phoenix area to attend one. The Cave Creek Fiesta Days Parade is a celebration of the old west. The Cave Creek Fiesta Days Parade is the kickoff event to Fiesta Days in Cave Creek, Arizona. Cowboys and cowgirls from all over the Phoenix area attend Fiesta Days events, including the rodeo. Continue to 18 of 67 below. Continue to 19 of 67 below. The Phoenix Pride Parade is held in April in conjunction with the Phoenix Pride Festival in Phoenix, Arizona. Continue to 20 of 67 below. Continue to 21 of 67 below. The Memorial Day Parade in Surprise is held in May. It is one of several Memorial Day celebrations in Greater Phoenix. Continue to 22 of 67 below. Continue to 23 of 67 below. Rawhide Clown Day is an annual event held at Rawhide Western Town in Chandler. During that event, all the clowns parade down Rawhide's Main Street. Here's an entire photo gallery dedicated to Rawhide Clown Day in Chandler, Arizona. Continue to 24 of 67 below. Continue to 25 of 67 below. © Anthem at Merrill Ranch, used with permission. The Independence Day Parade at Anthem at Merrill Ranch is always held in July, of course. It is one of many 4th of July events held in Arizona. Continue to 26 of 67 below. Continue to 27 of 67 below. The Fire Prevention Day and Parade event in Glendale, AZ is held in the fall. Continue to 28 of 67 below. Continue to 29 of 67 below. © City of Avondale, used with permission. The Billy Moore Heritage Days is an annual event in the City of Avondale. Here's an entire photo gallery dedicated to the Billy Moore Heritage Days Parade in Avondale, Arizona. Continue to 30 of 67 below. Continue to 31 of 67 below. Photo provided courtesy of Gilbert Promotional Corporation. The Gilbert Days Parade is one of several activities during Gilbert Days, celebrating the heritage of Gilbert, AZ. It is held in the fall. Continue to 32 of 67 below. © ASU, used with permission. The public can attend the ASU Homecoming Parade in Tempe. Continue to 33 of 67 below. Continue to 34 of 67 below. Photo provided courtesy of the Phoenix Annual Parade of the Arts. The Phoenix Annual Parade of the Arts is "....a lively and fanciful showcase of costumed revelers, crazy antics, and artistic endeavors...."
Continue to 35 of 67 below. Continue to 36 of 67 below. courtesy of Cave Creek Chamber. The Wild West Days Parade in Cave Creek, Arizona is held in the fall. Wild West Days includes a rodeo, cookouts entertainment and many western style family-friendly activities. Continue to 37 of 67 below. Continue to 38 of 67 below. Continue to 39 of 67 below. Photo provided courtesy Wild West Days, used with permission. Continue to 40 of 67 below. © Heather Butcher, used with permission. On Veterans Day each November we stop and take at least a few moments to honor America's veterans. In Mesa, we honor them with a parade, The East Valley Veterans Day Parade. Continue to 41 of 67 below. Continue to 42 of 67 below. On Veterans Day each November we stop and take at least a few moments to honor America's veterans. In Phoenix, the VA honors them with a local parade. Here are more pictures of the Veterans Day Parade in Phoenix, Arizona. Continue to 43 of 67 below. On Veterans Day each November we stop and take at least a few moments to honor America's veterans. In Tempe, we honor them with a parade in downtown Tempe in the Mill Avenue District and Tempe Beach Park areas. Continue to 44 of 67 below. Continue to 45 of 67 below. On Veterans Day each November we stop and take at least a few moments to honor America's veterans. In Goodyear, we honor them with a parade in the community of PebbleCreek. Continue to 46 of 67 below. Continue to 47 of 67 below. On Veterans Day each November we stop and take at least a few moments to honor America's veterans. In Apache Junction, we honor them with a parade. The Veterans Day Parade is part of the Festival of the Superstitions. Continue to 48 of 67 below. Continue to 49 of 67 below. © Fountain Hills Times, used with permission. The Thanksgiving Day Parade in Fountain Hills is also called Parada de Los Cerros, or Parade of the Hills. You'll be able to see the famous Fountain Hills fountain, too. Continue to 50 of 67 below. Continue to 51 of 67 below. Ahwatukee Harley-Davidson Parade Photo © Festival Of Lights, used with permission. This is one of many wonderful holiday celebrations taking place in the greater Phoenix area. This photo was taken at the Festival of Lights in Ahwatukee, which is in Phoenix, AZ. Continue to 52 of 67 below. © City of Chandler, Arizona, used with permission. The Chandler Parade of Lights is an annual community holiday parade, and is one of the many events associated with Christmas holiday lights celebrations. Here are some more pictures of the Chandler Parade of Lights in Chandler, Arizona. Continue to 53 of 67 below. © Carefree Christmas Festival, used with permission. The Carefree Christmas Festival includes a holiday parade. It is one of the many events associated with Christmas celebrations. Continue to 54 of 67 below. Continue to 55 of 67 below. © City of Phoenix, Arizona, used with permission. The APS Electric Light Parade is a Phoenix tradition, and is one of the many events associated with Christmas holiday lights celebrations. Here's an entire photo gallery dedicated to the APS Electric Light Parade in Phoenix, Arizona. Continue to 56 of 67 below. Continue to 57 of 67 below. © Downtown Tempe Community, Arizona, used with permission. The Tempe Fantasy of Lights Boat Parade is a nationally recognized parade, and is one of the many events associated with Christmas holiday lights celebrations. Here's an entire photo gallery dedicated to the Tempe Fantasy of Lights and Boat Parade in Tempe, Arizona. Continue to 58 of 67 below. Continue to 59 of 67 below. Christmas in the Park Parade Photo © City of Litchfield Park, Arizona, used with permission. This photo was taken at a previous Christmas in the Park celebration in Litchfield Park, Arizona. Continue to 60 of 67 below. Photo © Fiesta Bowl, used with permission. The Fiesta Bowl Parade is a nationally recognized parade, and is one of the many events associated with the Fiesta Bowl football game. Here's an entire photo gallery dedicated to the Fiesta Bowl Parade in Phoenix. Continue to 61 of 67 below. Continue to 62 of 67 below. The Ostrich Festival Parade is held a week before the very popular Ostrichy Festival in Chandler. The parade is sponsored by Thorobred Chevrolet. Before the parade, there is a 5K Fun Run. Continue to 63 of 67 below. Continue to 64 of 67 below. Continue to 65 of 67 below. Chandler Holiday Parade Photo © City of Chandler, Arizona, used with permission. This picture was taken at the Parade of Lights Holiday Festival in Chandler, Arizona. Continue to 66 of 67 below. Continue to 67 of 67 below.